Short Attention Span:Remember the Gulf? It almost seems like years ago now that we all daily watched as million of gallons of crude oil spilled into the gulf of Mexico live on our televisions. Once the well was capped, well then, news story over. Time to move the cameras to the Next Big Disaster. It isn't over though, especially not for those who live near or make their living off of the gulf. BP’s Deepwater Horizon disaster poured 4.9 million barrels of crude oil into the Gulf of Mexico. Some washed ashore, even more sank into the gulf. The full impact of all this oil has yet to be felt. The Clean Water Act clearly specifies that BP and other parties will be required to pay fines for the damage to the gulf. There will probably be a lot of wrangling over how much the fines are because there is basically a per barrel fine. This may be why BP was so keen to underestimate the amount coming out at the time. By some estimates, fines may be as much as $21 billion dollars. Here's the astounding thing. The Clean Water Act does not specify that the money from fines be used to mitigate the damage caused by the disaster. If the government really wants to they can use the money to buy bombers, get haircuts, or even give subsidies and tax cuts to oil companies. This is crazy. Clearly the money need to go toward mitigating the damage from the spill. The White House seems to agree as their long-term Gulf Coast recovery plan developed under the guidance of U.S. Navy Secretary Ray Mabus, recommends that Congress “dedicate a significant amount of any Clean Water Act penalties to the Gulf Coast’s recovery.” We can all trust Congress to do the right thing right? Right? Here's the challenge. We need a lame-duck congress to pass legislation dedicating recovery funding to the gulf region. One be the best and easiest ways to get them to do that is to write your legislators. Audubon has made this extremely easy. Do you have three minutes? Audubon has an online form you can use to send a letter to congress. They've done all the hard work, you just have to fill in some forms. I tend to think personal short messages mean more than the long-winded educational message pre-filled into the form means. A simple message saying, "Please pass legislation directing Clean Water Act fines against BP toward restoration efforts" is all it really takes. You can even send the generic message if you wish. The idea is to get the senate to hear that this is important. Numbers talk. We need lots of people to send messages. 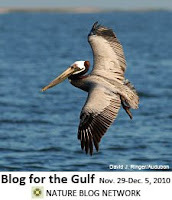 Money from oil spill fines must go to help restore the gulf! Thanks for doing your part to restore one of the gems of America. A healthy gulf is a healthy America.